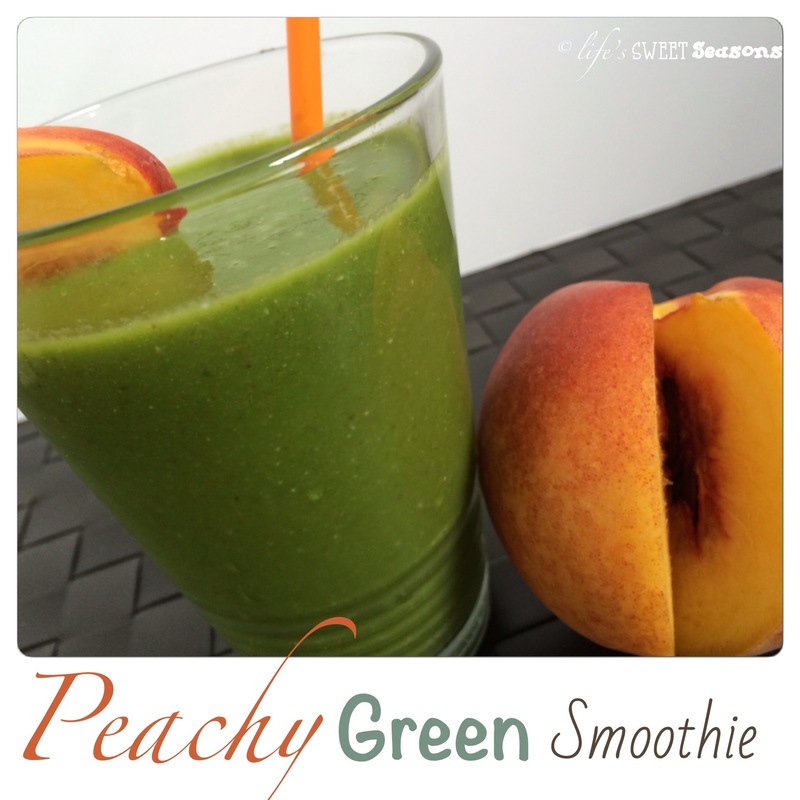 We make green smoothies a ton! Usually I just throw in some juice, yogurt and the prepackaged fruit mix that I buy from Sam’s Club along with spinach. The thing is though, when you make something the same way every time, it tastes the same every time. LOL Deep, I know. It’s just that with smoothies I’ve been letting convenience get the best of me instead of really thinking about what’s going into the smoothie that will make it taste unique. After all, if we’re drinking green smoothies nearly every day I need to change it up so my kids don’t get bored. This week peaches are on sale at the grocery store and I can’t pass up peaches. On Sunday I went to Kroger and they had peaches for 99 cents a pound so of course I bought some. Okay, you’re right, I bought a ton. Then on Tuesday I was browsing through Walmart and even though I knew I still had peaches left in my fridge from Sunday I saw that they were on sale there too so I had to get more. It’s like when your favorite movie is on TV and you already own it, but you can’t bring yourself to change the channel. Ever happen to you? I told Jiminy Cricket that even though I knew it wasn’t wise to buy something when I had no idea what I was going to do with it, peaches are peaches and if nothing else, I would just slice it up and Lindsay and I could enjoy it for a sweet snack. 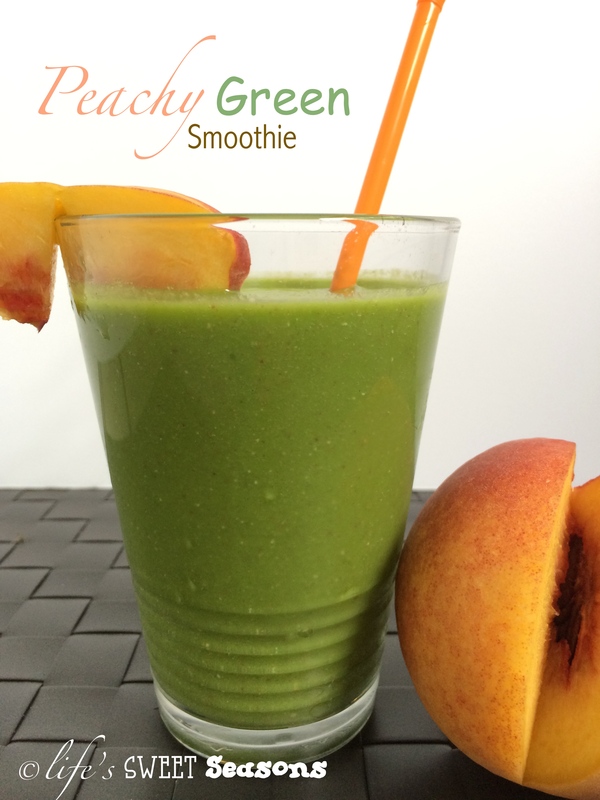 When I made this smoothie the first time, it was definitely a change from the “norm.” Which was slightly surprising because the frozen fruit mix that I always use has frozen peaches. I think we liked this smoothie so much because there wasn’t anything else in the smoothie to take away from the peach flavor, so it was exceptionally summery and fresh. When Lindsay tried it she said, “Mmmm it taste-es just like strawberries!” (which I’m guessing was because of the chia seeds) and I raised my eyebrows and laughed out loud. You’ll notice that my recipe isn’t as “healthy” as some die-hard green smoothie makers, but I have a three and four year old that never turn down a green smoothie because I make ’em sweet. I figure with the fruit, chia, and spinach that they’re getting each time I make a smoothie, I don’t mind that they’re also getting sugar from the honey and yogurt. PS-The best vanilla yogurt I have ever tried hands down is Tillamook Vanilla Bean, but I haven’t been able to find that since we moved from Utah. 😦 Nope it wasn’t Greek, yup it was probably loaded with sugar, but we would add fresh fruit to it after dinner and call it dessert and it was delicious! Add the ingredients to a blender in the order written and push the smoothie cycle!